Today I came across a nice post by Tod Werth, who created a nice theme for the OSX Terminal program called IR_Black. All you have to do is download his schema and open in it Terminal. Then tweak the colors a bit to fully meet our needs. So that is pretty cool 🙂 Thanks Todd! 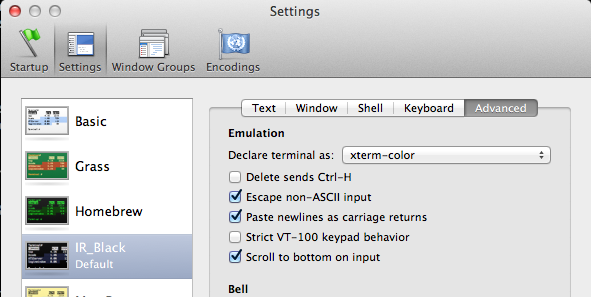 I found that using these setting brought some trouble when working in vim and nano. Changing the terminal from “xterm-256color” to “xterm-color” fixed that for me.